Should Singapore Seriously Consider Nuclear Power To Reduce Reliance On Neighbour’s Energy Supplies; No More Whipping Boy Politics? – Sinking It In! The latest diplomatic spat between Malaysia and Singapore has shone a spot light on how Singapore is always at the mercy and largesse of neighbours. One moment it could be issue A and magically another issue B would be raised and Singapore has to scramble to defend its positions. First it was the ILS implementation over Seletar Airport, next it was a maritime boundary dispute, after which it became a possibility that Malaysia would stop exporting eggs overseas (hint hint Singapore) to maintain low prices domestically. Nobody really knows what would come next, could energy be the next lever to be squeezed by our unpredictable neighbours? Singapore currently imports natural gas from neighbouring Malaysia and Indonesia and natural gas imports is responsible for almost 95% of our electricity generation. Would it then be wiser for Singapore to begin its energy diversification and invest in safe nuclear energy so that it can no longer be held to ransom over something so precious and essential to our daily lives. In fact, Singapore could even use this nuclear technology and sell energy to our neighbours if they wish, to make it a win win situation. Singapore has no beef with our neighbours, we are too small to want to cause trouble for others. If going nuclear can safeguard Singapore’s energy security and make the lives of our neighbours better too, why not right? 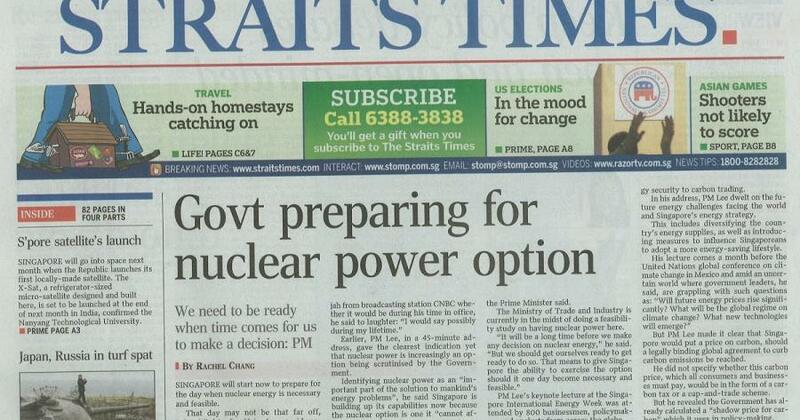 Now the problem is whether Singapore has the local talents to make running a nuclear plant possible and the security infrastructure needed to ensure a sabotage-free nuclear facility. That requires more thinking but think we must because Singapore cannot be always held to ransom whenever our neighbours needed a good whipping boy as distraction.